See our featured past events and links to outputs and videos online below. Visit our Oxford Talks archive for the comprehensive list of events added to our Oxford Talk collections. A one-day conference bringing together cohorts studying conservation MSc to generate a greater sense of collective identity and empowerment; explore the ideas and drivers that suggest a transformation in the science, policy and practice of conservation; and facilitate and encourage 'new generation' conservationists to voice and reflect upon the values, issues and practice which they would like to see at the centre of conservation when they are mid-career (20-years hence). 26 January 2017. The Linnean Society of London, Burlington House, Piccadilly, London. Professor David Harvey, Distinguished Professor of Anthropology and Geography, Graduate Center of the City, University of New York. 25 January 2017. Halford Mackinder Lecture Theatre, SoGE, Oxford. Dr Jeremy Leggett (Carbon Tracker, Solar Aid, solarcentury). The Energy Transition IS happening and its happening faster than you may think. Dr Jeremy Leggett is a writer, social entrepreneur, founder of Solarcentury and SolarAid, and Chair of Carbon Tracker who has spent the last 30 years at the forefront of the switch away from fossil fuels and towards renewables. At a time of great political uncertainty, Jeremy will demonstrate how unstoppable positive change is already underway. Public lecture. 18 January 2017. Halford Mackinder Lecture Theatre, SoGE, Oxford. Prof Myles Allen (Environmental Change Institute), Dr Thomas Hale (Blavatnik School of Government, Oxford), Prof Benito Mueller (Environmental Change Institute). 17 January 2017. Oxford Hub, Turl Street Kitchen, Oxford. An opening presentation by Dr Richard Damania of the World Bank will be followed by a set of two moderated panels. The event convenes leading experts from the World Bank, Oxford, Australian National University and UK Department for International Development. 17 January 2017. Main Lecture Theatre, Oxford Martin School, Oxford. Various speakers. 7 December 2016. The Andrew Wiles Building, Radcliffe Observatory Quarter, Oxford. Sheila Dillon, BBC. IFSTAL Public Lecture 2016. 5 December 2016. H O Beckit Room, SoGE, Oxford. Webinar: What does the Paris Agreement on climate change mean for civil engineering? Dr Matthew Ives, ECI Senior Researcher and Philip Wolfe, Director of Community Energy England discuss what does the Paris Agreement on climate change mean for civil engineering. 23 November 2016. Institute of Civil Engineers in London. A free teacher CPD session delivered by Prof Richard Washington in partnership with the Royal Geographical Society (with IBG). 17 November, SoGE, Oxford. Prof Alan MacDonald, British Geological Survey. W. Mike Edmunds Memorial Lecture. 3 November 2016. Blue Boar Lecture Theatre, Christ Church, Oxford. Flocking Environmentalists in association with Oxford Spires Academy and the School of Geography and the Environment. 1 November 2016. Oxford Spires Academy, Glanville Road, Oxford. 1 November 2016. Saïd Business School, Park End Street OX1 1HP, Oxford. 27 October 2016. H O Beckit Room, SoGE, Oxford. 20 October 2016. MOA Room, SoGE, Oxford. Organised by Estate Services Environmental Sustainability Team, Environmental Change Institute, Saïd Business School, and new energy Systems Thinkers. 18 October 2016. Saïd Business School, Park End Street OX1 1HP. An introduction to Oxford University's innovative Smart Handpump research. 17 October 2016. A J Herbertson Room, SoGE, Oxford. 29-30 September 2016. Invited Conference, Corpus Christi College, University of Oxford. 27 September 2016. This Symposium focused on Drought Science and Management in the UK and around the world. Lady Margaret Hall, Oxford. 23 September 2016. Dame Julia Slingo, Met Office. MOAP Special Lecture. Halford Mackinder Lecture Theatre, SoGE, Oxford. 20-22 September 2016. International Conference, Environmental Change Institute, University of Oxford. 17 September 2016. An informal lunch as part of Meeting Minds, the Alumni Weekend in Oxford. A J Herbertson Room, SoGE, Oxford. 17 September 2016. Dr Katrina Charles gave a talk about the �15m REACH: Improving Water Security for the Poor research programme as part of Meeting Minds, the Alumni Weekend in Oxford. Halford Mackinder Lecture Theatre, SoGE, Oxford. 3 September 2016. SoGE and Balliol College, Oxford. 11 - 22 July 2016, Designed for those interested in leading environmental change with business, the SSEE Summer School combines our strengths in environmental economics and policy, enterprise management, and financial markets and investment to study critical global environmental challenges in the 21st century. SoGE, Oxford. 1 July 2016, The Second Oxford Global Infrastructure Conference will focus on the highly topical subject of China's 'One Belt One Road' Initiative and will feature a series of critical keynotes addresses and interactive discussions from leading thinkers across academia, international organisations, government, business and the investment industry. The Examination Schools, Oxford. 26 June 2016, SoGE geographers Ben Hennig and Danny Dorling present some of the key challenges and questions relating to the future of people across the world, using a series of seven thought-provoking maps about our lives on the planet. Part of Oxfordshire Science Festival. Story Museum, Pembroke Street, Oxford. 20-21 June 2016, Centre for Doctoral Training in Science and Engineering in Arts Heritage and Archaeology (SEAHA) conference on heritage science research, innovation and best practice in the interpretation, conservation and management of cultural heritage. SoGE, Oxford. 16 June 2016, J Gottmann Room, SoGE, Oxford. 15-16 June 2016, Royal Society, London. 9 June 2016, Oxford Networks for the Environment and Oxford Space Research Network will explore the breadth of EO research across the University. Dennis Sciama Lecture Theatre, Denys Wilkinson Building (Physics), Keble Road, Oxford. 2 June 2016, The Oxford Wine Café, South Parade, Oxford. 26 May 2016, Turl Street Kitchen, Oxford. 9 May 2016, SSEE/SoGE, Oxford. A student conference organised by Oxford Food Forum and Cambridge Food Security Forum. 7 May 2016, Halford Mackinder Lecture Theatre, SoGE, Oxford. Pop-up screening organised by InTandem together with director Fran Lambrick. 26 April 2016, Turl Street Kitchen, Oxford. Organised by Oxford Friends of the Earth in association with Agile-Ox. 16 April 2016, SoGE, Oxford. Panel discussion chaired by Dr Bettina Wittneben, Lecturer and Advisor, Strategic Environmental Management. 11 March 2016, Halford Mackinder Lecture Theatre, SoGE, Oxford. The aim of the 9th annual Oxford Environment and Enterprise Forum is to strengthen links between the international graduate student body of the School of Geography and the Environment and Oxford-based organisations at the cutting edge of environmental policy and practice. 4 March 2016, SoGE, Oxford. Speakers: Dr Erik van Sebille (Grantham Institute & Department of Physics, Imperial College London); Prof Richard Thompson (School of Marine Science and Engineering, Plymouth University), and Dr Lucy Woodall, (Department of Zoology, University of Oxford and Scientific Associate Natural History Museum, London). Hosts: Dr Lucy Woodall and Dr Thomas Thornton. 3 March 2016, A J Herbertson Room, SoGE, Oxford. Dr Jamie Lorimer and Dr Ben Hennig participated in an event introducing the Anthropocene and exploring the interaction between artistic expression and some of the current scientific thinking on the environmental impact of humankind. 26 Feb 2016, Turl Street Kitchen, Oxford. Prof Dariusz Wójcik, Professor of Economic Geography, SoGE. 25 Feb, 2016, Halford Mackinder Lecture Theatre, SoGE, Oxford. A conversation between the author, Andrea Wulf, and Prof Yadvinder Malhi, Professor of Ecosystem Science, SoGE. Rothermere American Institute Special Event. 11 Feb 2016, RAI, 1a South Parks Rd, Oxford. An innovative cycling hackathon, bringing people together to develop ideas to monitor and improve cycling for all in Oxford and beyond. 5-6 Feb 2016, The Story Museum, Oxford. Careers Workshop, hosted by the Business Fellows Programme. 4 Feb 2016, Saïd Business School, Oxford. Three-day conference convening leading global thinkers and practitioners from government, enterprise, civil society and academia to advance and debate risk-based analysis of water security. 9-11 Dec 2015, Oxford Martin School and St Catherine's College, Oxford. COP21 side event. 7 Dec 2015, Observer Room 4, Paris le Bourget Exhibition Centre. University of Oxford Carbon Innovation Programme. 1 Dec 2015, Martin Woods Lecture Theatre, Oxford. SSEE Business Fellows in an interactive and engaging debate. 23 Nov 2015, SoGE, Oxford. Dr Jessica Tierney, University of Arizona. 4th Trapnell Lecture. 11 Nov 2015, SoGE, Oxford. SSEE Roundtable Discussion. 10 Nov 2015, Smith Centre, Science Museum, London. Can resource prosperity be shared? SSEE Panel Discussion. 27 Oct 2015, Weston Library, Broad Street, Oxford. 23 Oct 2015, Waddesdon Manor, Aylesbury. 16 Oct 2015, Halford Mackinder Lecture Theatre, SoGE Oxford. ESRC Interdisciplinary award, Tech Natures, and TORCH Environmental Humanities award supported conference on information, control, and the environment. 15 Oct 2015, Halford Mackinder Lecture Theatre, SoGE Oxford. 8 Oct 2015, J.P. Morgan, 60 Victoria Embankment, London. 1-2 Oct 2015, Pembroke College, Oxford. 24-25 Sep 2015, Queen's College, Oxford. 19 Sep 2015, SoGE, Oxford. 18 Sep 2015, SoGE, Oxford. 8 Sep 2015, Exeter College, Oxford. 19-23 Aug 2015, Examination Schools, Oxford. 2 July 2015, St Catherine's College, Oxford. 18 June 2015, Wolvercote Village Hall, Oxford. 15 June 2015, SoGE, Oxford. Panel discussion with globally recognised experts. 1 June 2015, Saïd Business School, Oxford. Various speakers, 16-17 April 2015, SoGE, Oxford. Various speakers, 6 March 2015, SoGE, Oxford. Various speakers, January - March 2015, SoGE, Oxford. Professor Yadvinder Malhi, 12 February 2015, RGS-IBG, London. 3 February 2015, H O Beckit Room, SoGE, Oxford. 20 January 2015, Blue Boar Lecture Theatre, Christ Church, Oxford. 15 January 2015, Halford Mackinder Lecture Theatre, SoGE, Oxford. 12 January 2015, J Gottmann Room, SoGE, Oxford. 1 December 2014, Halford Mackinder Lecture Theatre, SoGE, Oxford. 24 November 2014, Lecture Theatre, Oxford Martin School, Oxford. 13 November 2014, Pusey Room, Keble College, Oxford. 7 November 2014, Halford Mackinder Lecture Theatre, SoGE, Oxford. 8 October 2014, School of Geography and the Environment, Oxford. 1-2 October 2014, Jesus College, University of Oxford. 22 September 2014, Grove Auditorium, Magdalen College, Oxford. 20 September 2014, School of Geography and the Environment, Oxford. 2-3 July 2014, SoGE, Oxford. What future for environment reporting? A panel discussion. 20 June 2014, Halford Mackinder Lecture Theatre, SoGE, Oxford. 17 June 2014, Maths Institute, Oxford. 2 June 2014, Cumberland Lodge, Windsor. 30 May - 1 June 2014, SoGE and Wolfson College, Oxford. 23 May 2014, The Tanner Room, Linacre College, Oxford. 9 May 2014, SoGE, Oxford. 3 May 2014, SoGE, Oxford. 22-26 Apr 2014, SoGE, Oxford. 27-28 March 2014, St Catharine's College, Cambridge. 18-20 March 2014, St John's College, Oxford. 2pm-5.30pm, 28 February 2014, Halford Mackinder Lecture Theatre, SoGE, Oxford. 15 February 2014, Halford Mackinder Lecture Theatre, SoGE, Oxford. Climate Change in Himalaya: Cracks in the "Roof of the World" - including the release of their book "Himalaya: Mountains of Life"
Environmental decision-making in the European Union: who exercises power? Cancun COP16 Panel Discussion: "A beacon of hopere-ignited"? 13 January 2011, Merton College, Oxford. 13 November 2010, SoGE, Oxford. 12 November 2010, SoGE, Oxford. 29 October 2010, SoGE, Oxford. 23-24 September 2010, Corpus Christi College, Oxford. 8-10 September 2010, School of Geography and the Environment, Oxford. 6-7 September 2010, School of Geography and the Environment, Oxford. 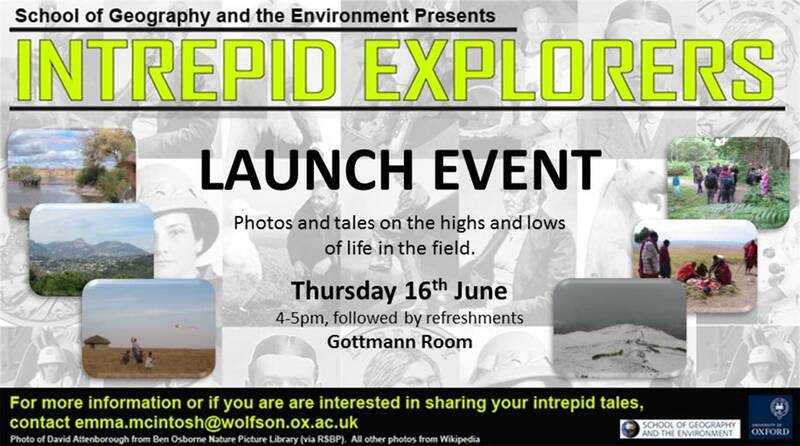 5pm, Friday 2 July 2010, H O Beckitt Room, School of Geography and Environment, Oxford. 25th June 2010, A J Herbertson Room, School of Geography and Environment, Oxford. 22-23 June 2010, School of Geography and the Environment, Oxford. 10 June 2010, A J Herbertson Room, SoGE, Oxford. Ivy on Walls: Bio-deterioration or Bio-protection? 19 May 2010, Geological Society of London, Burlington House, Piccadilly, London. 29 May 2009, Seminar Room 6, St Anne's College, Oxford. Monday 25 May 2009, MSc Room 1, School of Geography and the Environment, Oxford. 16-19 September 2008 - Molopo Lodge, Northern Cape, South Africa. 29 May 2008 - School of Geography, OUCE, University of Oxford. 8-10 April 2008 - Balliol College, Oxford. 29 February 2008 - Harris Seminar Room, Oriel College, University of Oxford. 22 February 2008 - St Hilda's College, University of Oxford. 15 February 2008, Magdalen College Auditorium. Soft Wall Capping Conference - Soft Wall Capping: A better way of conserving ruins? Monday 22nd October 2007, Geological Society of London, Burlington Arcade. Friday 19 October 2007, OUCE. Saturday 22 September 2007, OUCE. 20-21 September 2007, University of Oxford. 19-21 September 2007, Jesus College, Oxford. Heritage conservation today: Consensus or collision? 18th September 2007, Worcester College, Oxford. How much data do we need to effectively manage coral reef fisheries? For information about our forthcoming events, seminars and talks go to our Oxford Talks webpage.